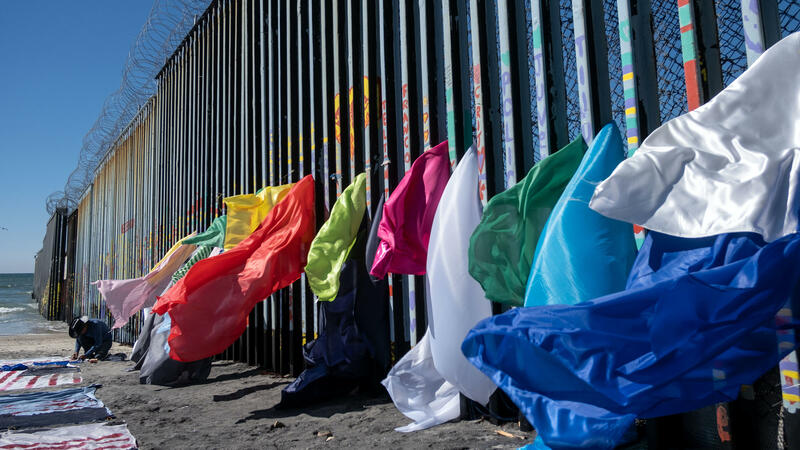 Central American migrant artist Robenz creates an installation on the Mexico-U.S. border fence in Playas de Tijuana, Baja California state, Mexico, on Feb. 24. The resolution now heads to the Senate. It is a privileged measure, which means it is not subject to a filibuster, needs only a simply majority and is required to come to the floor for a vote within weeks. Senate Majority Leader Mitch McConnell, R-Ky., told reporters on Tuesday that he expects the Senate will vote on it before March 18. So far only three Senate Republicans — Susan Collins of Maine, Lisa Murkowski of Alaska, and Thom Tillis of North Carolina — say they will vote with Democrats in opposition to the president's actions. The Republican-led Senate is split 53-47, which means Democrats need one more vote in addition to Collins, Murkowski and Tillis for the measure to pass. McConnell declined to handicap the vote, but other members of Senate leadership including Sen. John Barrasso, R-Wyo., said they expect it to pass the Senate. Vice President Pence and a Justice Department lawyer huddled privately with Senate Republicans for their weekly Tuesday meeting that was dominated by debate over the president's legal authority to use his emergency powers as he has to find funding for a border wall. McConnell characterized it as a "robust, vigorous" discussion and said he had not "reached a total conclusion" over the legality of the president's actions. However, McConnell has already publicly committed to voting against the resolution in support of the president's position. The White House asserts that the president has the legal authority to declare a national emergency and to redirect existing federal funds to address that emergency. Congress did approve $1.375 billion for new physical barriers along the border in a spending bill approved earlier this month, but it was less than the White House requested. Soon after, the president declared a national emergency to redirect more than $6 billion to build additional barrier. If the resolution reaches his desk, it will be the first veto of Trump's presidency. House Minority Whip Steve Scalise, R-La., told reporters that Congress will not be able to block Trump's emergency declaration. "When you see the vote today there will be nowhere near the votes to override a veto," he said, "Ultimately we are gonna stand with the president in making sure we can secure this border and confront this national crisis that's taking lives every single day." A coalition of 16 states has filed suit against the Trump administration to try to block his emergency declaration. Speaker Nancy Pelosi, D-Calif., and Senate Minority Leader Chuck Schumer, D-N.Y., have also said they will challenge the national emergency declaration in court, setting up a potential constitutional test over the balance of power between the legislative and executive branches of government. An earlier version of this story incorrectly said the House approved by a 245-183 vote a resolution to block President Trump's national emergency declaration. The vote was actually 245-182. A border wall, constitutional powers and what qualifies as an emergency - they were all up for debate in the House today, which voted to block President Trump's national emergency from taking effect. He declared the emergency earlier this month after Congress did not give him all of the money he wanted to build a border wall. His opponents say, in doing so, he is seizing constitutional power that rightly belongs to Congress. NPR congressional correspondent Susan Davis joins me now. And, Sue, tell us, how did the vote shake out? SUSAN DAVIS, BYLINE: You know, Democrats tried hard to get Republicans onboard to support this. They tried to frame it more as a constitutional argument, not about an immigration debate. And the argument that Democrats are making is that Congress has the sole authority to spend federal funds and that the president in using these emergency powers to spend money against Congress' wishes is a violation of the Constitution. Here's House Speaker Nancy Pelosi during the debate today. NANCY PELOSI: Is your oath of office to Donald Trump, or is your oath of office to the Constitution of the United States? You cannot let him undermine the strength of your pledge to protect and defend the Constitution. DAVIS: It was not a very convincing argument for Republicans. The resolution, ultimately, did pass on the strength of Democratic votes with just a handful of Republicans joining them. KELLY: And, Sue, why didn't this message resonate with Republicans? Because the message about executive overreach was something that Republicans fought the Obama administration over, exact same grounds. DAVIS: I think one other thing that this debate has highlighted is the hypocrisy among a lot of lawmakers on the Hill when it comes to this question of executive overreach. Earlier during debate, Republicans noted that during the Obama administration, Democrats were not as outraged when a Democratic president used executive power to do things like try and change immigration laws. House Minority Whip Steve Scalise was talking to reporters earlier today, and he just made clear there's not going to be a lot of daylight between the administration and Hill Republicans on this question. STEVE SCALISE: At the same time, the president is on strong legal ground to declare this emergency. And when you see the vote today, there will be nowhere near the votes to override a veto. This emergency declaration will be upheld. But, ultimately, we're going to stand with the president in making sure we can secure this border and confront this national crisis. DAVIS: Scalise was right. You need two-thirds of votes in both chambers to override a veto. They did not have that vote today. It was clear that that is not going to happen. KELLY: OK. So where does this leave things? Because next, this resolution will head to the Senate, the Republican-controlled Senate. What's the dynamic there? DAVIS: It's a bit more complicated because I think Republicans do tend to take a longer view about the precedents they're setting here. Vice President Mike Pence was up on the Hill today. He brought along a lawyer from the Justice Department to continue to make the case, the administration's case, to Senate Republicans on why they should support it. Senator Mitch McConnell, the majority leader, wouldn't handicap the vote. He just said there will be one within the next week or two. Democrats have managed to bring along three Republicans. Thom Tillis of North Carolina, Susan Collins of Maine, Lisa Murkowski of Alaska have all said they will vote with Democrats and against the White House on this. But, again, you need a two-thirds majority to override the president. The White House has already said they will veto this when it gets to his desk. So I think talking to lawmakers today, the one thing is clear is that they believe that the ultimate fate of this will be decided in the courts. And House Speaker Nancy Pelosi and Senate Minority Leader Chuck Schumer have said they will challenge it there. KELLY: All right. Thank you, Sue. KELLY: NPR's Susan Davis. Transcript provided by NPR, Copyright NPR.